Our Deconstructed Eggplant Moussaka recipe is full of flavour and deliciously different. Using pantry staples, this baked eggplant casserole is easy to make following our five simple prep steps. Cut eggplant lengthwise in half. Scoop out eggplant flesh, leaving 1/2-inch-thick shells; coarsely chop flesh. Cook chopped eggplant and onions in nonstick skillet on medium-high heat 5 min., stirring frequently. Add meat; cook until evenly browned, stirring occasionally. Stir in tomato and basil pasta sauce; bring to boil, stirring frequently. Simmer on medium-low heat 10 min. or until slightly thickened, stirring occasionally. Stir in cinnamon and 3 Tbsp. parsley. 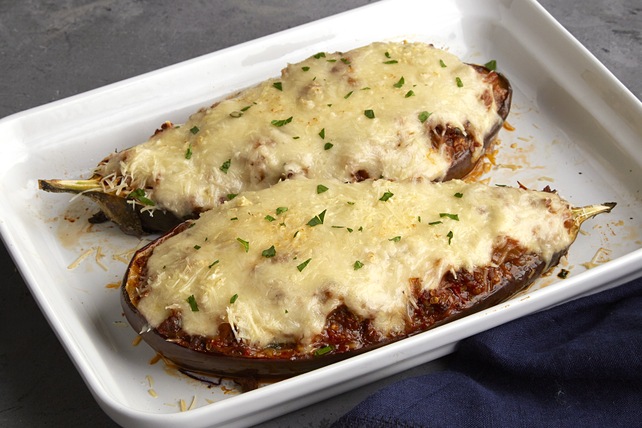 Place eggplant shells, cut sides up, on rimmed baking sheet; fill with meat mixture. Top with Alfredo pasta sauce and cheese. Bake 30 to 35 min. or until eggplant mixture is heated through and cheese is lightly browned. Sprinkle with remaining parsley. Prepare using extra-lean ground chicken. Substitute dried oregano leaves for the cinnamon.